When I started reading this book, “Jonson Road” by Clayton E. Spriggs, I just didn’t want to stop until I’d read the whole thing. There are so many great characters (good and bad) and the suspense throughout the book just keeps building and building and Kept me wanting to read more……. Kept me guessing the whole way. Recommend the book to those that enjoy a good thriller that is dark and unpredictable. Great writing and will look for more from Clayton Spriggs in the future. “Johnson Road” is one of the most creepy, original, and well-crafted novels I’ve read in a long time! I was completely drawn in from the opening scenes, and absolutely loved the author’s use of description of the different scenery and locales, and his attention to detail especially with the characters. It starts off in 1963, and then there are some time jumps that I admit confused me at times, I’d lose track of what characters were when, but it was easy to read and had some really shocking twists. Can see fans of Steven King loving this one. Warning…when starting this book make sure you don’t have anywhere you need to be or anything you need to do because you won’t want to stop reading until you’ve finished it all!! Trust me on this! The book starts off with an intriguing, unforgettable beginning and just keeps going from there. The characters were nicely developed and completely unpredictable… I do wish there was more dialogue as at times I felt the narrative was a bit too lengthy in spots and it kind of slowed things down– seems like there was a lot of backstory when I wished there was more ‘forward action’. But overall the pacing was good and towards the end I was turning the pages of my kindle as fast as I could, and had several “oh my God” moments. Crazy, twisted, thriller that will appeal to fans of the genre. Adults only. Woah, what an insane book (ha- literally)! I’m not one for rehashing the plot (that’s what the summary is for on the book description page), but I didn’t expect to be so sucked into this world that Mr. Spriggs created as I was. I will probably have nightmares! That Purvis Johnson is one ‘interesting’ guy! there is so much mystery and intrigue and ‘what the heck is happening here’ that you can’t help but want to keep reading more and more. And the way that the author does the characters we just see more and more but then are still surprised. There are many shocking twists and overall I thought the storyline was original and well written. A few typos and formatting things, but nothing terrible. Recommended read. 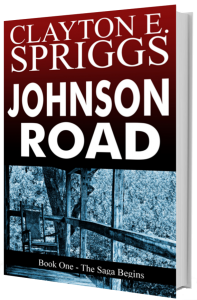 Okay, I don’t even know where to begin because so much happens and I don’t want to give anything away… “Johnson Road” by author Clayton E. Spriggs is one of the most original and just flat out interesting mystery/thriller/suspense novels I’ve ever read. I liked it for so many different reasons, first the writing was great. The strong word choice and fluid prose makes it a very easy book to lose yourself in. There are enough descriptions where you can picture everything perfectly, but not so much that it bogs down the pacing. I wish I knew what the characters looked like better though, because some of them I had hard time keeping straight. I liked that there were things I haven’t seen in other books like this before, and the interweaving plotlines were complex enough to keep me interested and engaged, but no so much where you get confused… a great book that will stay with me for a long time. Let the bodies hit the floor! Yikes! Okay this book is not for the faint of heart or easily spooked… it is downright creepy and at times quite disturbing. So if you are into that then this is the book for you! I will say that it did take me some time to get into this book… although it starts off with an inciting incident, it slows afterwards as the author worked more on the characters and the situations, rather than the drama… but then it starts to build at a slow simmer, leading to a full-on boil that is quite exciting. You have small town Americana, weird occurrences, disappearances, abduction, mysteries, deaths… nothing is as it seems and the events are crazy terrible. Addicting reading and I look forward to more from Clayton Spriggs.